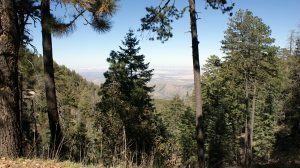 The Chiricahua Mountains are a mountain range in Southeastern Arizona which are part of the Basin and Range province of the Southwest, and part of the Coronado National Forest. 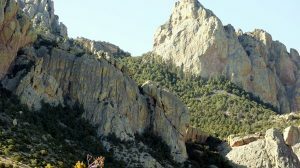 The highest point, Chiricahua Peak, has an altitude of 9,750 feet above sea level, and is approximately 6,000 feet higher than the surrounding valleys. The Chiricahua Mountains, and other associated ranges, along with the Sulphur Springs Valley on the west and the San Simon Valley on the east, form the eastern half of Cochise County in southeast Arizona. The Pedregosa Mountains are found at the southern end of the Chiricahua Mountains, while the Swisshelm Mountains are located to the southwest. The northwest end of the Chiricahua mountains continue as the Dos Cabezas Mountains beyond Apache Pass and the Fort Bowie National Historic Site. 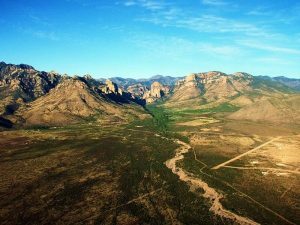 Access to the Chiricahua Mountains and Coronado National Forest is through Wilcox, AZ, from the north, Douglas, AZ, from the south, and Rodeo, NM, from the east. The Chiricahuas are a naturalist’s paradise, something scientists have known for decades. The American Museum of Natural History operates its famous Southwestern Research Station 4 miles from Cave Creek Ranch. Scientists come from all over the world to study the area’s unique reptiles, amphibians, insects, plants, mammals, and birds. The Chiricahua Mountains were formed by volcanic eruptions spanning 35 to 25 million years ago. The last major eruption, 27 million years ago, created the Turkey Creek Caldera and laid down 2,000 feet (610 m) of volcanic ash which fused into welded Rhyolite tuff. Subsequent erosion has created canyons and mountain ridges covered in stone spires and stone columns that rise up out of the forest. A one to two mile wide band of sedimentary rock running southeast to northwest from south of Portal through Paradise and up to the Dos Cabezas Mountains is the source of mineralized deposits of tin, lead and copper. The largest of the mines developed in the Chiricahuas was the Hilltop mine which consisted of 3 interconnected levels totaling 6,098 meters (20,007 ft). The earliest evidence human activity in the vicinity is in Clovis archeological sites, such as the Double Adobe Site in the Whitewater Draw tributary of Rucker Creek north of Douglas. Subsequently the Cochise, another pre-ceramic based culture spanning 3000 – 200 BC, was identified from sites around the Chiricahua Mountains, including Cave Creek Canyon. Following the transition to ceramics, diagnostic ceramics characteristic of Mogollon culture and its local variants, the Mimbres culture, are found spanning the period from 150 BC – 1450 AD. After a substantial gap, the Chiricahua Apaches appeared in the late 17th century, and occupied the area until forced removal in the late 19th century. Notable Apaches included the leaders Cochise and Geronimo. The first recorded mining claim in the Chiricahua Mountains was the Hidden Treasure claim filed in 1881 and mining has continued intermittently to the present with the greatest periods of activity occurring from 1890 to the 1920s. Sky islands are mountains isolated by surrounding lowlands of a dramatically different environment. This, in combination with the altitude zonation of ecosystems, has significant implications for natural habitats. Endemism, vertical migration and relict populations are some of the natural phenomena to be found on sky islands. The complex dynamics of species richness on sky islands draws attention from the discipline of biogeography, and likewise the biodiversity is of concern to conservation biology. Designated as a “Sky Island” ,The Chiricahua Mountains provide some of the greatest diversity of species in all of North America, for birds as well as mammals, reptiles, plants, and insects. With Mexico less than 40 miles to the south, Cave Creek Ranch has hosted many exciting strays from south of the border. These include Blue Mockingbird, Yellow Grosbeak, Aztec Thrush, Eared Trogon and Flame-colored Tanager. The great diversity of the plants and animals of the Chiricahuas evolved because of this bio-geographical mix, and because of distinct regional climate patterns. True desert communities exist from roughly sea level to about 4,000 feet, but on the mountains, for every 1,000 feet gained in elevation, the average temperature drops about four degrees, and rainfall increases about four inches. So while the deserts around the Chiricahuas are baking at 100ºF on a dry June midday, the mountain peaks are a comfortable and damp 75ºF, thus allowing species to thrive that would die if you plucked the hapless creatures off the mountains and deposited them in the desert. The elevational break in heat and additional moisture are the keys to life for the plants and animals that are surviving in the Sonoran and Chihuahuan Desert regions on mountain ranges surrounded by seas of desert and grassland. This is the origin of the romantic term “sky islands” now in popular use to describe the 42 or so such ranges in the deserts of southern Arizona and northern Mexico. Other well-known sky islands include the Huachuca Mountains (home of Ramsey Canyon), the Santa Rita Mountains (home of Madera Canyon), the Catalina Mountains, and the Baboquivari Mountains (home of Brown Canyon).